Colleges and universities around the state are finding it hard to keep up with a fast-growing appetite for computer-science courses. Four years after graduating from the University of Washington, Audra Linsenmayer began to realize that the job opportunities were few for someone who had majored in English and psychology, as she had. She was working as a contractor at Amazon.com, editing children’s books and comic books for the company’s Kindle, when Web developers there suggested she look into a degree in computer science at Western Washington University. She enrolled there in winter 2015, joining the thousands of Washington students who are seeking — or trying to seek — computer-science degrees. Across the state, Washington’s colleges and universities are working to meet students’ insatiable demand, and the market’s insatiable appetite for people trained in computer science. The schools are creating new programs and related majors, ramping up hiring of professors, and constructing new buildings to house it all. At WWU, the clamor for computer-science classes is so strong that the school this month sent a letter to 150 potential transfer students, warning them they may have to wait a year before they can start taking courses in the subject. Five years ago, about 100 students were pre-majoring or majoring in computer science at Western. Today, that number is more than 500. “It’s absolutely staggering,” said Western computer-science professor David Bover. And now students at Bellevue College may be able to major in computer science as well: The school this year won approval from the state Legislature to offer a bachelor of science in the subject starting this fall. If it wins approval from a state board and an accrediting agency, Bellevue would become the first community college in the state to offer a bachelor of science in a subject that’s also available at a four-year university. Computer science is one of the most lucrative careers for grads. WWU students often make a six-figure starting salary, Bover said — more than what most of their professors make. “We think that’s great — the job market is just fantastic,” he said. But that’s led to the crunch at WWU. Even though the school received an extra $3 million from the state Legislature in 2013, hired five additional faculty and started a cybersecurity program in conjunction with Whatcom Community College, it still can’t keep up with demand. And that’s why Western is limiting the number of computer-science courses transfer students can take, giving priority to students who have been at Western since freshman year, Clark said. 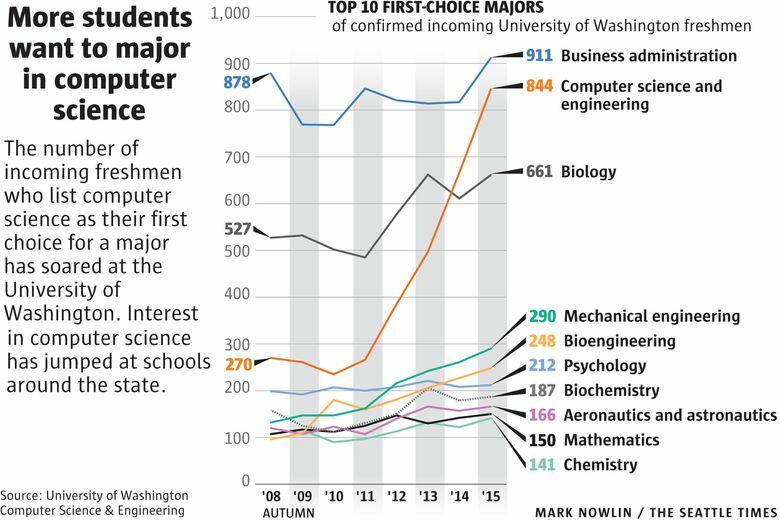 At the University of Washington, interest in introductory computer-science courses — even among nonmajors — continues to soar. Students recognize that a basic understanding of the field is essential for so many jobs, said Ed Lazowska, who holds the Bill & Melinda Gates Chair in Computer Science & Engineering at the UW. In fall quarter of last year, enrollment in the first of two computer-science introductory courses at the UW hit 3,000 — hundreds more students than had signed up for the same course a year earlier. Computer Science & Engineering is now the second-most-popular major listed by incoming freshmen — it surpassed biology last year — and if the trend continues, it will soon overtake the most-popular major, business administration. Demand is so great that only about one-third of students who apply to major in computer science and computer engineering are accepted into the program. The UW awarded 364 computer-science and computer-engineering degrees last year and is continuing to expand the major. But the department is running out of space, Lazowska said, which is why the UW plans to build a second, $104 million computer-science building on the Seattle campus. On the other side of the state, in Pullman, Washington State University has seen its computer-science enrollment more than double in five years, from 225 students in 2010 to 531 in 2015. Computer engineering has gone from 103 students in 2010 to 145 in 2015. 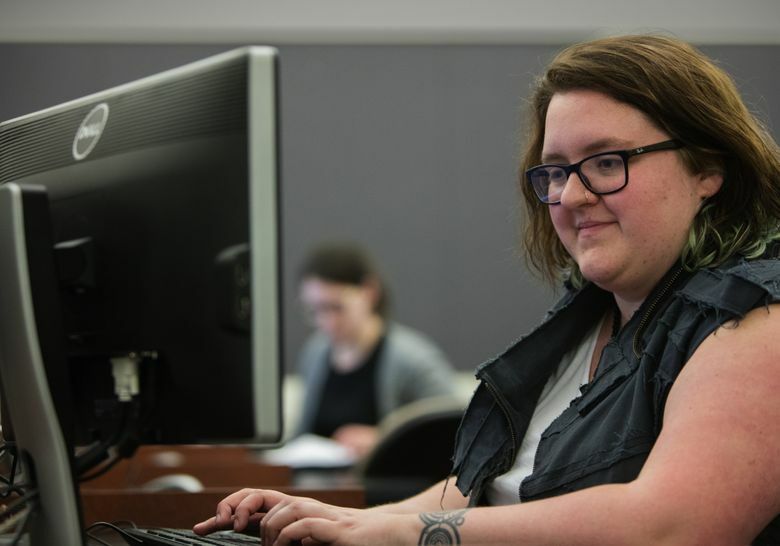 WSU plans to offer two new bachelor’s degrees, in software engineering and data analytics, and an online master’s in software engineering. The programs have been approved by the university’s Faculty Senate, and now must be approved by WSU’s regents and accredited by the Northwest Commission on Colleges and Universities, said Behrooz Shirazi, director of WSU’s School of Electrical Engineering and Computer Science. At Central Washington University, work is under way on a $64.5 million building to host programs in computer science, mathematics and information technology, said Richard Moreno, CWU director of content development. 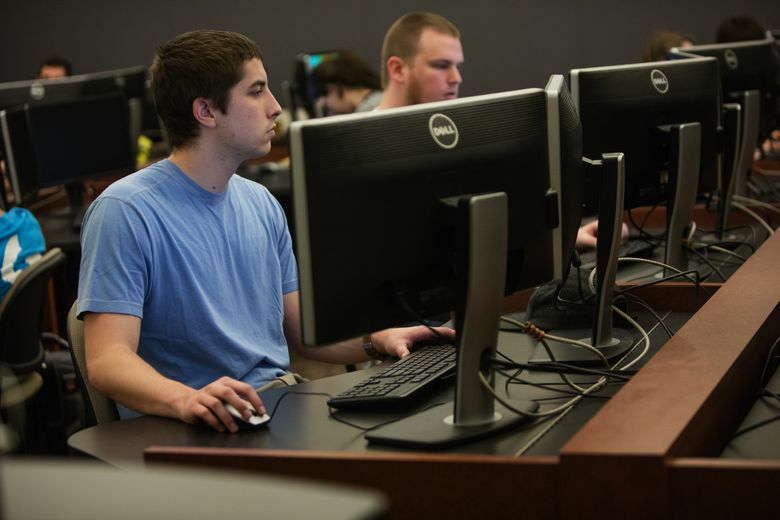 The space is needed because of a 114 percent jump in information-technology majors, with more than 1,050 students majoring and minoring in the subject this year. The smaller computer-science major has grown from 44 students five years ago to 74 this year at the Ellensburg campus. At Eastern Washington University in Cheney, the bachelor’s in computer science is the school’s most popular degree, with enrollment that has doubled, to 400, in a few years. EWU has had to raise the bar for admission to the program and increase class size, among other measures, to avoid freezing students out of courses, officials there said. Even The Evergreen State College, which doesn’t offer majors in specific fields, has seen an uptick in demand for its computer-science offerings, said spokeswoman Meryl Lipman. And the trend is the same at private schools, such as Seattle University, where computer-science majors have jumped from 59 in 2010 to 167 last fall quarter. The soaring demand is why Bellevue College has gotten the go-ahead to offer the field as a major, even though state policy usually prevents community colleges from offering the same kinds of bachelor’s degrees that students can earn at the state’s four-year colleges. That policy is designed to prevent duplication and competition. Even with the Legislature’s blessing, Bellevue must still gain approval from the State Board for Community and Technical Colleges, and accreditation from the Northwest Commission on Colleges and Universities. Until that occurs, the school can’t advertise the program. But college leaders expect it will go forward. “We’re very confident we’re going to develop a highly competitive, quality degree,” said Bell, who said the school has been meeting with focus groups and industry experts to design the program. Bover, the WWU computer-science professor, said that in recent years some UW students have transferred to WWU for computer science because they couldn’t get into the highly regarded program at the state’s flagship university. “They’re wonderful students — some are absolutely brilliant — they end up being some of our best,” Bover said. Jacob Shafer is one such student. In his sophomore year at the UW, still unsure of his major, he tried an introductory course in computer science. A few weeks into the course, he knew he’d found his calling. But Shafer worried he’d never get into the UW’s computer-science program because he had no internships or related experiences on his résumé, activities that can boost the chance of getting in. Instead, he decided to transfer to Western in fall 2014.